These are made from 2” nb size upto 24” nb diameter. Material of construction is M.S., S.S., Al, G.I. as per requirement. Precisely finished center rotor ensures proper and accurate feeding of material under extreme load conditions. • Drop through Rotary Vales – loading directly from top side and conveying side at bottom / below. 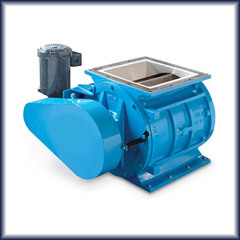 • Blow through Rotary Valves – material fed by air from side and conveyed along the path on other side or bottom.